Welcome to the beautiful Havelland! At the gates of Berlin and Potsdam in the middle of a unique and beautiful landscape lies the fishing village Ketzin / Havel. Enjoy the rustic flair while strolling through the narrow, winding streets of the "fishing district" and the cozy old town to the park-like banks of the Havel promenade. An ideal place to unwind. Ketzin is located in a welcoming nature with endless water, wide valleys, wetlands and enchanted pastures that stimulate relaxing walks, hiking, cycling and leisurely boat rides on the Havel. Here you can enjoy the untouched nature and experience the diverse wildlife up close. We assure you that we are enthusiastic about the nature of the Havel country. You have to see them, they have to experience and the best again! Come see the vastness of the landscape, the smell of the woods, the clear waters of our lakes and the Havel. Embark on and explore the Havel country on foot, by bike, on horseback or on the water. The apartment Zander is located in the 1st. Floor, is about 53m ² and suitable for 2 - 5 people. It has a very cozy bedroom (double bed and one to a single bed fold out chair) with Havel view. The bedroom is accessible from the living area via a staircase to the loft. From the large living / dining room with kitchenette, you can also access the loggia with garden views facing south. The large and friendly living and dining area with kitchen is ideal for cooking and relaxing. The apartment has high quality and features in all rooms and underfloor heating. The living area has an additional sofa bed. The kitchen is equipped with oven, stove, refrigerator and dishwasher. In addition, there is a kettle, a coffee machine, a mixer and much more .. The bathroom has a walk-in shower. Towels and sheets are ingebriffen in the price. 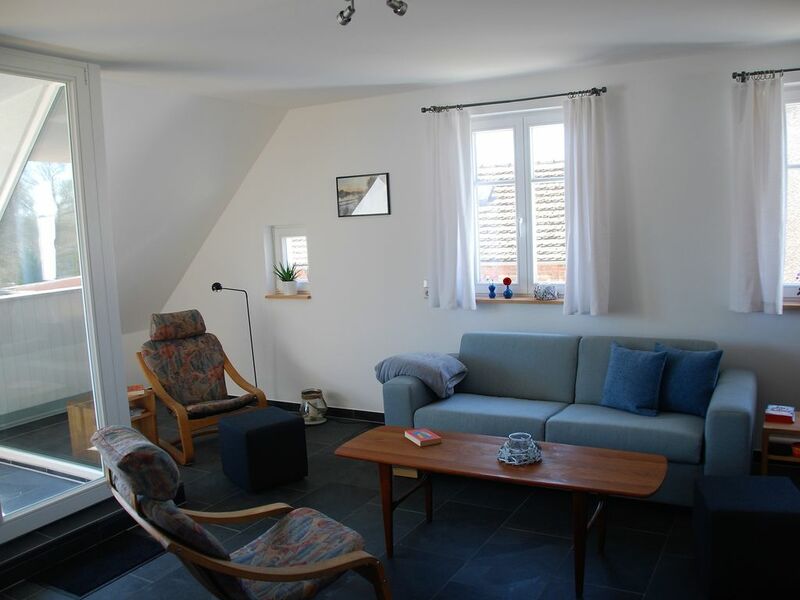 The apartment Hecht is located at ground level and barrier-free on the ground floor of a three-family house, is about 72 m² in size and suitable for 2 - 6 people. It has 2 separate double bedrooms and a large living / dining room with kitchenette. On the patio door a mosquito screen door is attached and partly on the bedroom windows. All windows can be darkened with shutters and / or shutters. The large and friendly living and dining area with kitchen is ideal for cooking and relaxing. The kitchen is equipped with oven, stove, refrigerator and dishwasher. In addition, there is a kettle, a coffee machine, a mixer and much more .. The bathroom has a walk-in shower. Towels and bed linen are included in the price. On request, a roll / Badewagen, high chair and travel cot are provided. The bathroom has in addition to the floor heating over a towel radiator. The cozy outdoor terrace invites you to relax and have a barbecue, especially in summer. Furniture, parasol and a south-facing electric grill are available for use on natural stone tiles. All bedrooms are designed with real wood parquet and the other living / dining rooms with natural stone floor. On our private island "to small Werder" you can spend relaxing hours away from everyday life. Enjoy the beautiful landscape of the Havel to the fullest. A rowing boat we can provide are available. Fishing licenses can be purchased at the Tourist Information. Bicycles can be rented there for 8 € per day. In the Albrechtstr. 2 cars can fill up with electricity directly at the market square. Charging costs max. 7.25 € (no matter if partial or full load. The electricity can either be paid via a charging card from the electricity supplier, by credit card or via an app. The bathroom has a walk-in shower. On request, a winding / bathing trolley can be provided. The bathroom has heated floors in addition to over a towel radiator. Towels and hair dryer are available. Ferienwohnung sehr geschmackvoll mit Liebe zum Detail eingerichtet. Vermieter sehr freundlich. Ein absolut gelungener Urlaub! Sehr schön modern und gemütlich eingerichtet und sehr sauber. Es ist eine sehr schöne Wohnung, sehr ruhig gelegen, aber von hier aus kann man schnell viele Sachen erreichen. Die Vermieter sind sehr nett und zuvorkommend. Wir würden hier immer wieder Urlaub machen ☺️. Wir freuen uns sehr, wenn es unseren Feriengästen bei uns gefällt. Anregungen nehmen wir gerne auf, damit der Urlaub bei uns noch erholsamer wird. Wir waren berufsbedingt bei Fam. Kerkeling zu Gast. Es war alles zu unserer Zufriedenheit. Die Kommunikation verlief reibungslos. Alles perfekt. Vielen Dank an Familie Kerkeling für diese wunderbaren Tage. Die Wohnung ist sehr modern und hochwertig ausgestattet. Sehr schöne Wohnung, gute und neue Ausstattung, sehr sauber, schöner Ausblick, alles in allem super! Swimming, fishing, boating or just silent longing. Swimming pleasures in Ketziner beach located within walking distance right on the Havel. Fun for the whole family! Swimming Havel, rowboat or Canadians drive, slackline, stand up paddling, beach volleyball - the lido Ketzin / Havel offers many opportunities to have fun. Dining options include a food court provides. Nature fishing, if you do not catch a fish or the manifold opportunities and outstanding waters invite you to linger. The joy is great when the fish you catch sizzles in the pan or pot hinköchelt in front of him. Fishing licenses are available at the tourist office for € 8 per day. Discover on an approximately 10 km long circular route most popular sites and places between Ketzin / Havel and Paretz. You have to pick the small pleasures (Theodor Fontane). With countless events guests are invited to music, rural traditions, exhibitions, romantic evenings, markets and much more in the region. Berlin, Potsdam and Brandenburg are in about 20 - 30 minutes by car or by bus or train (Wustermark / Elstal) to achieve. Charles Erlebnishof in Elstal is 25 km away.